Clean Up The Air Pollution In Your Home! At the very least, today's home should be fitted with a ventilation system utilizing a roof or sidewall surface mounted fan (see above illustration). Minimal ducting and cash outlay is required for this type of system. 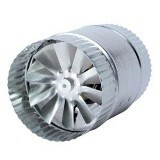 The fan exhausts stale air to the exterior. 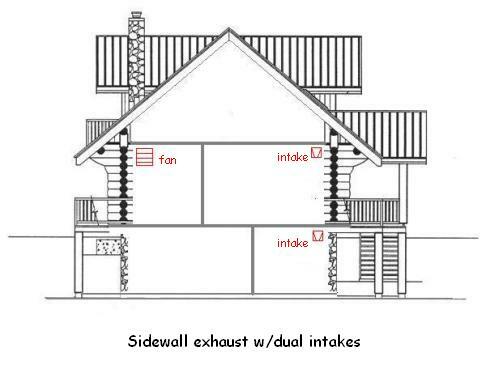 A screened intake is installed on each floor at the opposite end of the house from the exhaust fan. This system is controlled by a standard 120 volt switch, allowing the occupants to have total control over when the system is used. The fan outlet should be covered with 1/2" screen and a louver to keep the birds out. Same goes for the inlets. One-way barometric dampers installed at the inlets will help keep hot and cold air where it belongs. The dampers will open to provide fresh outside air, when the fan is energized and the home is pulled into a negative pressure. Ashrae recommends that homes receive .35 air changes per hour, but not less than 15 cubic feet per minute (cfm) per person. A common rule of thumb is 15 cfm multiplied by the number of bedrooms plus 1. A 3 bedroom house would need 60 cfm of outdoor air by the rule of thumb method. 3 bedrooms + 1 X 15 cfm = 60 cfm. The above system utilizes an inline fan, which can be exhausted through a sidewall louver, once again with dual intakes (1 on each floor). 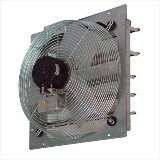 Variations to this system could be terminating out through the roof, locating the fan in a mechanical room for service. You are limited only by configuration of ducting. Both this ventilation system and the previous one are negative pressure systems. This system can be controlled by a standard occupant controlled switch or by a more sophisticated sensing control system. The intakes and exhaust should be screened and equipped with one-way barometric dampers to keep the cold and hot air where it belongs. Both of these aforementioned systems should provide 100 cfm to 400 cfm of ventilation for your home, and not break the bank. The above systems will certainly help improve your home's indoor air quality, but now we are going to throw a wrench into the works! Ashrae states, "Dwellings with tight enclosures may require supplemental ventilation supply for fuel-burning appliances, including fireplaces and mechanically exhausted appliances." So now, we are going to look at some controlled ventilation systems capable of providing both ventilation for removal of indoor air pollution and providing supplemental make-up air. 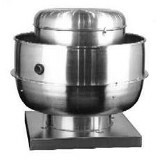 The above ventilation system is a ducted economizer ventilation system. This particular system has dual purposes and uses. It can provide whole house ventilation, as well as spot winter cooling for a high use area of the home, such as a home theater. For this use the system must be zoned. Damper 1 controls the outside air. Damper 2 controls the return air from inside the residence. When fresh air is called for, damper 1 opens and damper 2 closes, allowing full fresh outside air to be delivered through the supply air ducting to all areas of the home. If this system is to be utilized during the cold winter months, in a cold climate, the outside air duct must be insulated, and the entering air must be be preheated before the air is distributed by the air handler or furnace. If sized properly, this system will keep the residence in a constant positive pressure allowing fireplaces to vent properly, provide displacement air for the range hood, and bath fans. 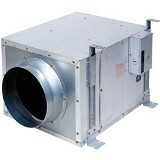 This system also provides plenty of cfm for the necessary air changes to keep indoor air pollution under control. 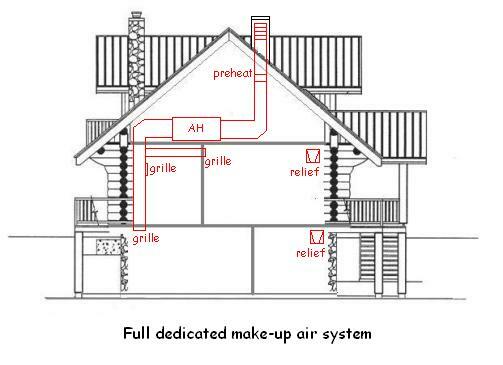 This full make-up air system utilizes an air handler with full outside air on the return side. 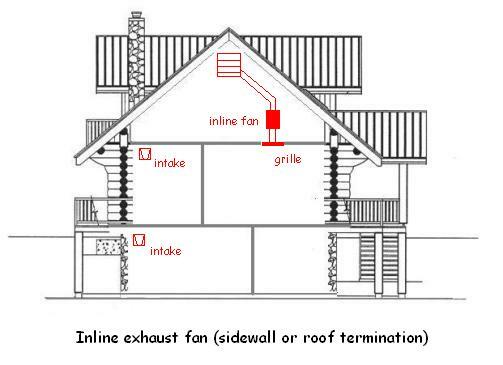 In our example illustration, the unit is located in the attic, but could just as easily be located in a crawlspace or mechanical room. In cold climates this system could include a duct furnace, or electric heat strips, or a hot water coil (boiler system) to temper the outdoor air as it is drawn in. Cooling could be added, as well. The intake air can be a sidewall mounted grille or through-roof, as in our example. The system should be installed with multiple supplies. Doors into separate rooms, such as bedrooms and baths, should be undercut to allow airflow. I prefer the use of reliefs on any ventilation system, although I have seen these systems installed without reliefs. In this case, existing channels such as bath vents, chimneys and dryer vents allow a certain amount of relief to the outside to dispell pollution and stale air. The air handler should be sized to deliver enough cfm to cover all exhaust systems as if they were all running at the same time. Some units and control systems can deliver proportional airflow, dependent upon the home's needs at the time.